Home » VANDERBILT, FREDERICK W.
The third son of William H. Vanderbilt, Frederick was active in running the numerous railroads in the family empire. 1943, New York. Bond for $1,000 for the Construction of Buildings for State Institutions Bearing 3 1/2%. 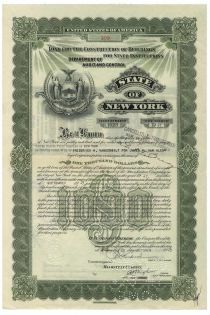 Issued to United States Trust Company of New York as Trustee under will of Frederick W. Vanderbilt for James H. Van Alen. Green/Black. Engraved vignette at top left of New York State Seal flanked by Liberty and Justice. Punch and stamp cancelled. Very fine. 1943, New York. $10,000 Loan for Highway Improvement bearing interest at 4%. Olive/Black. Engraved vignette of state seal at top center. Issued to Trustee under will of Frederick W. Vanderbilt for William Seward Webb. FREDERICK W. VANDERBILT (1856-1938). Third son of William H. Vanderbilt. Active in numerous railroads in the family empire. Punch hole cancellations. Very Fine. 1885, Michigan. 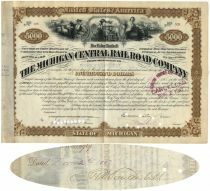 $5000 bond bearing 5% interest of the Michigan Central Railroad Company issued to and signed on verso by FREDERICK W. VANDERBILT. Brown/Black. Vignette of train flanked by farmer and sheep and seated female allegorical figure at top center. Third son of William H. Vanderbilt. Active in numerous railroads in the family empire. Stamp and punch cancelled Excellent.